If you are putting on a large event and looking to provide some other activities for people, catapult shooting fits the bill. It's relatively cost-effective to stage, but nonetheless adds a bit of variety and interest - letting your guests destroy plates stacked up on our 'Great Wall of (old) China' is always a crowd-pleaser! These aren't toys, but they do provide plenty of amusement and amaze a lot of people who haven't seen what a modern high-velocity slingshot can do. 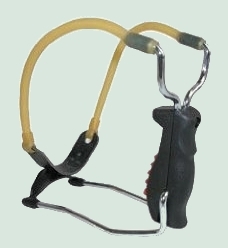 A catapult can be used to launch a wide range of different projectiles, but if used to fire a lead ball it is a perfectly serviceable tool for hunting wild game or competitive target shooting. As with every one of the activities we offer, proper safety supervision and instruction comes as part of the package.